When we call ranking, all of us think about Google. It is right Google is “king” of search engines, and how much better rank we have on Google, that much we will have visitors on our web site. So every web owner or webmaster is fighting to get better rank on Google, and they are not wrong, that it’s the best way to get many visitors on the webpage. Google is trying to improve their system and they want to get only must trusted, quality and not spam websites in their top ranked websites. So for making this reality they are making many algorithms and updates on it. So every day is harder and harder to get better rank on Google. Like many updates they have new one on their algorithm. This update will be good for surfers but it will be bad for internet marketing who are trying to make some money of the internet, exactly on their websites. This algorithm is about websites that have large popups. Do you now websites that when you go on it will open another tab with ad. I guess that you have visited that type of website, that other tab is called popup. These popups are containing various types of ads. And for every ad click or survey finished webmaster is getting some money. With Google’s new update websites that have big popups and that are popping out on every visit will be punished by Google. These websites will not get good rank on Google. This for sure is bad news for many internet marketers who are using this way to make some money on their internet web sites. This algorithm is called “page layout algorithm”. From Google are saying that when they are saw websites, they saw that what was crawled with their Google Bots, and because Google bots are not using any cookies they will see these ads (popups) every time when they visit page that is using popups. So because of that, that type of websites will get lower rank on Google. Also instead of this showing a big banner will be indexed and this will be not good for websites ranks. From Google are also giving a suggestion how these internet marketers who are using popups can make changes, so this algorithm will not affect on their rankings. They will be protected if they follow Google’s instructions. They are suggesting to all webmaster that are using popups to not show their popup if the visitor is on their websites for the second time. This is suggested because Google Bots are not using cookies. 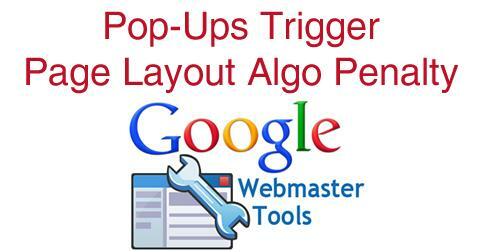 If the popup is showed after every visit of each visitor, then this can affect on the ranking of that website. So if you want better ranks on Google you should follow their advices. So if you are not showing your popup after every visit you will not have problems with your rankings for sure. Enjoy in your rankings. Stay aware with Google’s latest updates and be alert so as to avoid unwanted downgrades to your website rankings. To remain updated with Google’s news and new algorithms, get in touch with well known SEO Services provider Platinum SEO that provides best SEO Packages in Australia.